Run through stands of scented eucalyptus trees with gorgeous views of the volcanic Channel Islands on this 3 mile loop of coastal Goleta. Winding single track trails and spacious expanses make More Mesa Park a great spot to run the California coast in solitude. 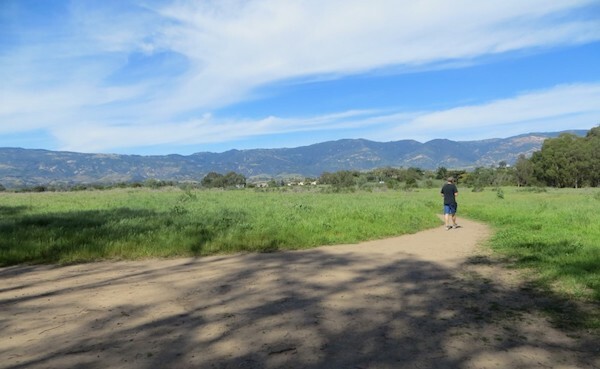 A network of trails criss-cross back and forth on one another, so you can choose your own adventure each time you explore this nice flat park. Or, you can drop down to More Mesa Beach for some sand running alongside spectacular cliffs and caves. The beach is a bit narrow, so running might depend on tides. Note that the beach is ‘clothing optional’. Add-Ons: For a longer run, the Obern Trail Bike Path is just east of the park, and goes for 3+ miles. Also, our route in UC Santa Barbara, and lagoon loop. 3.1 miles RT. Good add-on option is the Obern Trail Bike Path.